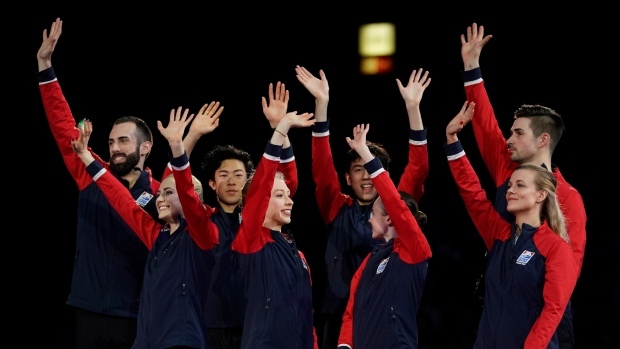 The U.S. topped the team standings with 117 points, with one-two finishes in the men's short and free programs in recent days by two-time and reigning world champion Nathan Chen and world bronze medallist Vincent Zhou. Defending champion Japan finished second overall with 104 points and Russia was third with 102. The Canadians, seeded sixth entering the competition, took fifth spot overall with 73 points. European champions Vanessa James and Morgan Cipres of France won the pairs free skate with 152.52 points. The Russian pair of Natalia Zabiiako and Alexander Enbert finished second with 141.32 and Canada's Kirsten Moore-Towers and Michael Marinaro, the Four Continents silver medallists , were third with 131.84. "I felt we performed this program better than at worlds," said Moore-Towers, from St. Catharines, Ont. "We used our breathing spots a little bit better and we learned a lot of lessons that we will take with us next year." "It's a little better to end the season on a positive skate," added Marinaro, from Sarnia, Ont.